See New York from a different perspective: from the water. 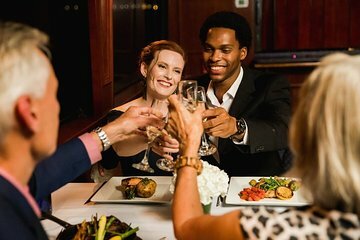 This 3-hour dinner cruise is a memorable way to spend an evening in New York City, marveling at the tall skyline and seeing some of the world's most famous landmarks, such as the Statue of Liberty, the Empire State Building, the Brooklyn Bridge and One World Trade Center. Drink libations, eat good food and listen to music as a DJ spins tunes onboard the boat. Consider upgrading to a private window-side table with Champagne — a Viator Exclusive available nowhere else! Head to Pier 40 Hudson River Park on the west side of Manhattan to begin this fun 3-hour dinner cruise, sailing around the Hudson River, the East River, and New York Harbor. Board the three-tiered yacht and then begin the cruise. During the opening reception, snack on appetizers and sip on a beverage, as you gaze out at the incredible views. At your table, peruse the menu of à la carte edibles, including pan-seared salmon, roast chicken, filet mignon and, of course, dessert (see sample menu below). After ordering your three-course meal, sit back and enjoy your surroundings. After dinner, listen to music from the DJ and buy a drink or two from the cash bar, as the dance floor begins to get going. Then gawk at the great sites, including the Brooklyn Bridge, the Manhattan Bridge, the Statue of Liberty, One World Trade Center, the Chrysler Building and the Woolworth Building. In addition to seeing the riverside of Brooklyn, you'll get a unique look at a plethora of new high-rise towers that are currently going up in Manhattan. The cruise finishes after three hours when it pulls into Pier 40. Optional Upgrade: Viator ExclusiveUpgrade yourself on the cruise to your own private window table. This will ensure a fantastic view from the boat. And that's not all: with the upgrade, you also get one complimentary bottle of Champagne per couple. It's an option only available on Viator! • Seared duck breast with roasted root hash. Nice to see a part of Manhattan and NJ and Brooklyn lights, bridges from a different angle. If it was closer to 2 hours instead of 3 it would have rated higher but that's not a complaint, just a suggestion. 3 hours was just too long, food was pretty good not disappointing but not astonishing by any means and they had our reservation wrong when we boarded which was VIP with champagne and window seat and it took awhile to sort that which Gabriel the manager did. The staff was great Gabriel and Samuel, Hernando, etc and the DJ played good music and it was a posh looking room on the boat which was a real highlight. The views of Empire State Building and Statue of Liberty were great, and sitting in a nice floating room was the highlight along with the lovely staff. Other than when we got out at 10pm and in late November it's pitch black outside and there were no taxis in the mythical taxi rank at the end of the docks of Pier 40, we had to go onto the street to flat down on taxi in what probably wasn't the most salubrious part of town for an older well-dressed couple to be hailing a taxi late at night on a Friday night. We would imagine that in warmer months there would be a lot more people and it would be very lively and even more enjoyable. No regrets and I would definitely recommend it for something different especially because it's more intimate. Love the boat, and the beautiful evening cruise. Very smooth ride, great sights including the lighted city skyline at night and the Statue of Liberty. Music, drinks, and dancing. Food good, but this is more about the cruise. Window seat enjoyable when eating, but the best photos will be from the deck outside or up top. From the moment we verified our reservation for the 3 hour light dinner cruise. everything was outstanding. The cruise, food, service and the music DJ was all worth the price. I would definitely use this tour again. I could have written a 3 page review, but I wanted to inform not bore. Just Do It! This is the third time I have taken this tour when bringing family member to NYC for their first time. On January 22, dinner cruise, it was terrible! The dining room was so hot we could not stay at our table for longer than 10 minutes without having to go outside to cool off. The music was the main thing that made our evening miserable. It was so loud we could not carry on a conversation. DJ played the same music all night and was so focused on a group of 5 single females that he ignored the remaining guest on the cruise. This made for a miserable evening for our family of 5. Would not recommend this cruise!! This was a celebration evening for my daughter's birthday and it didn't disappoint. From the canapé on entry to the boat through to the excellent meal, friendly servers and the dancing afterwards to the DJ on board, the whole evening was excellent. We paid extra for a window seat and champagne and it really was worth it for a special occasion. I would also add that I booked all three trips we took in New York with Viators from home in England and everything went very smoothly and when I had to phone their London office to inquire about something, everyone I spoke to was really helpful and friendly. Viators was recommended to us by a friend and we have recommended it to others in our turn. Great ambiance and great scenery for pictures once you get outside. Pics through the windows are not as good. Good food, subpar service, nice dance floor and DJ with good music. It was a great way to celebrate my 50th birthday. Great way to see the light of New York . The meal was a delicious 3 course meal. Seeing the Statue of Liberty as the sun set behind it was a great highlight of the tour. my wife and me enjoyed every moment of the dinner cruise.